Come support our friends, family and collaborators on the island of Puerto Rico while enjoying music from around the world throughout our Raíces Roots Music Concert Series. This series will bridge cultures through the universal language of music while supporting a sustainable, resilient and just recovery effort for the island of Puerto Rico. 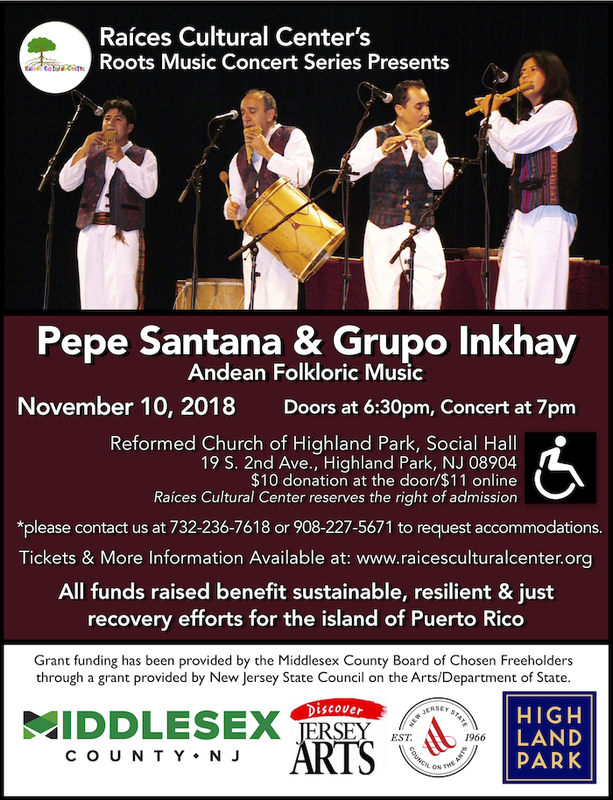 Join us for the next concert in the series featuring Pepe Santana & Grupo Inkhay as they present Andean folkloric music from Ecuador, Peru and Bolivia. *Accessible parking and entrance located in the back of the church, from the parking lot on Magnolia Street between S. 2nd and S. 3rd Aves. Seating is limited, reserve your tickets early!!! Raíces Cultural Center reserves the right of admission. -Please contact us at 732-236-7618, 908-227-5671 or raices@raicesculturalcenter.org to request accommodations. -Assistive listening devices are available upon request, please contact with your request at least 2 weeks in advance. All funds raised benefit sustainable, resilient & just recovery efforts for the island of Puerto Rico. Thank you to our community for your support and generosity.